I’m starting to think that the breakfast world has it wrong. I think many people have the impression that waffles are somehow trickier to make than, say, pancakes. In reality though, I find pancakes need a softer touch to really nail. Temperature can be hard to control on pancakes and it can be tough to get them exactly right. Meanwhile, waffles are dumb easy. You make the batter, put it in a waffle iron, and bam. Waffles. I swear I’ve even tried to sabotage waffles by doing stuff like making them with beer. They still turn out perfectly. 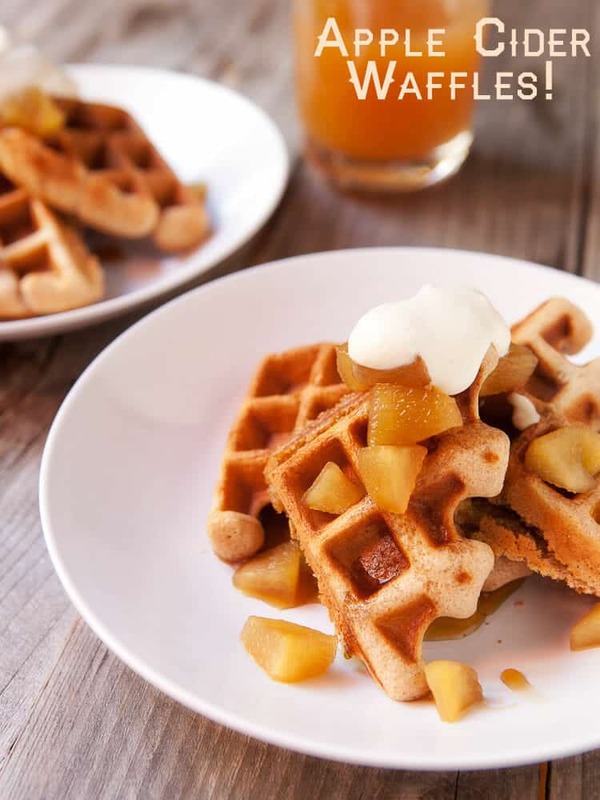 These Apple Cider Waffles are almost impossible to mess up. So I’ve been getting more confident with my waffle add-ins and this time of year apple cider seemed to be a great liquid to stir in. 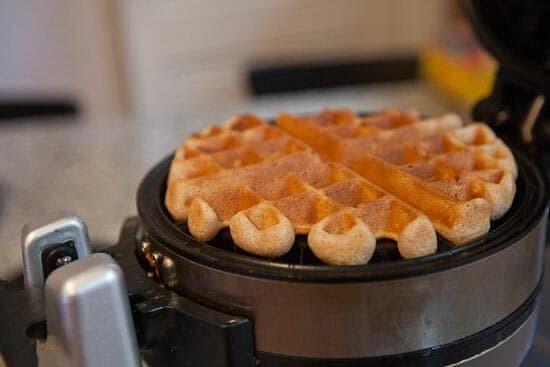 Apple Cider Waffles have a nice rich color with a slightly crispy crust. The waffle interior stays fluffy and nicely seasoned though. Homemade whole wheat waffles with a bit of spice, a crispy crust and a soft interior. Pile on the simmered apples and whipped cream! 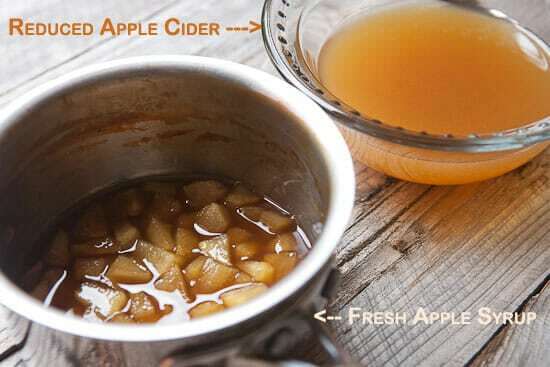 1) To make reduced apple cider, add 2 cups of good quality apple cider to a small pot over medium heat. Simmer until the cider reduces by half, about 10-12 minutes. THen let the cider cool and use in the waffles and in the syrup. 2) For the apple syrup, peel and dice fresh apples. Then combine ingredients in small pot and bring to a slight simmer over medium-low heat. Cook for 1-2 minutes until apples get tender. Then let cool and use to top waffles. 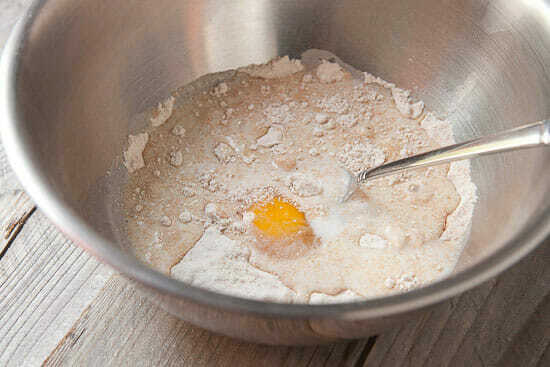 3) For batter, stir together dry ingredients.Then mix in milk, eggs, reduced apple cider and melted butter. The batter should be thick, but pourable. If it’s too thick, add more milk or apple cider to thin it out a bit. 4) Add batter to a large waffle iron (I like 1/3-1/2 cup batter per waffle). Cook waffles until they are golden brown. 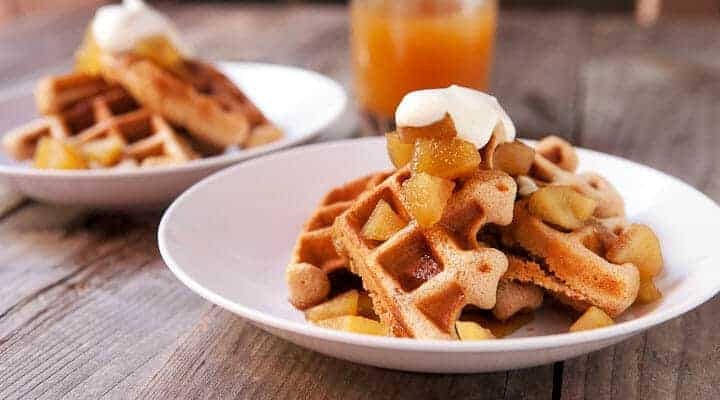 Serve waffles with fresh apple syrup and whipped cream! Recipe slightly adapted from this White on Rice couple recipe. Believe it or not, apple cider doesn’t have a super-strong flavor to it when you bake with it. It can easily get lost. To help bump up the flavor, I recommend reducing some cider by about half and then using that in the recipe. I started with about two cups of apple cider and let it simmer for about 10 minutes until it reduced by half. Then I let that cool and used the reduced liquid in the waffles and in the fresh apple syrup! I was feeling a bit lazy on this particular day so I just mixed all the waffle batter ingredients in a single bowl. Normally, I would maybe separate out the eggs and beat them and fold them back in, but on this day it was a one-bowl batter. Stir in the melted butter last and the batter for the apple cider waffles is done. 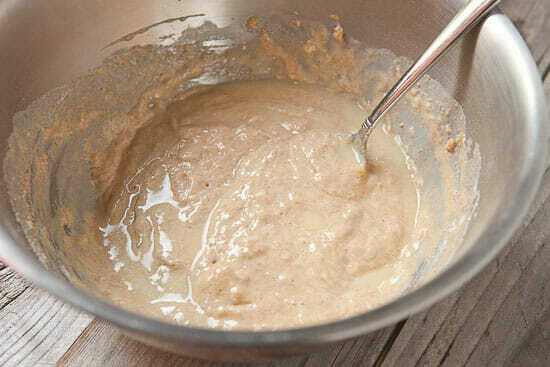 Again, I found this batter to be very forgiving. It should be thick, but pourable. The only trick is make sure your apple cider reduction is cool before stirring it in or it might cool the eggs a bit! Then heat up your waffle iron and pour on some batter. I have a nice big waffle maker and use about 1/3-1/2 cup of batter per waffle. These turned out golden brown and perfect! 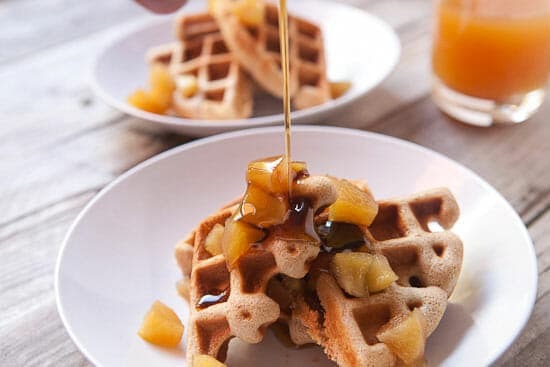 Serve the waffles while warm piled with some of the fresh apple syrup and a drizzle of extra syrup if you want. It never hurts to dollop on some whipped cream also! Waffles are easier than pancakes right? Agree… for many years I was a quick pancake guy, but these days waffles are way more appealing to me. Well, I’m addicted to beating the egg whites separately to make super-fluffy waffles, so I usually think pancakes are easier. But I like the idea of adding apple cider! May have to try that. I like doing the eggs separately sometimes too. To be honest, I’m not even sure they are harder with that step. Pancakes and crepes can be pretty finicky! Cool. I finally know the name of the name of the overflow edges that I’m ALSO addicted to!! Thanks Jean! These just sound amazing! Putting them into my weekend rotation. Thanks! I love raw apples, but I’m not a big fan of cooked ones, or apple juice or cider (I know…I’m weird), but I love waffles and will definitely try these!